There is an interesting article in the morning's New York Times that highlights the importance of two words. In this case the context is the economy and the world we live in. The two words were: "just below." The chairman, Jerome H. Powell, said the Fed’s benchmark interest rate was “just below” the neutral level, meaning the central bank was close to the point where it would not be tapping on the brakes or pressing on the gas. Only last month, Mr. Powell had said it was “a long way” from neutral, leaving investors worried that the rate increases would crimp growth. The small change sent stocks soaring 2.3 percent, erasing the losses from a rocky November. To investors, the new wording meant that the Fed might leave rates closer to their current level, keeping in place the steady fuel that low rates have provided to a 10-year-long bull market. For those who have retirement accounts invested in the market, all of their savings, so to speak, those two words hopefully marked the end of a disastrous couple of months that has seen overall values drop by over 9 percent since early October wiping out any gains made this year. 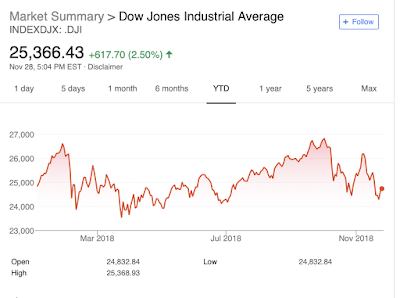 In looking at the Dow Jones chart, it has clearly been a roller coaster ride this year. 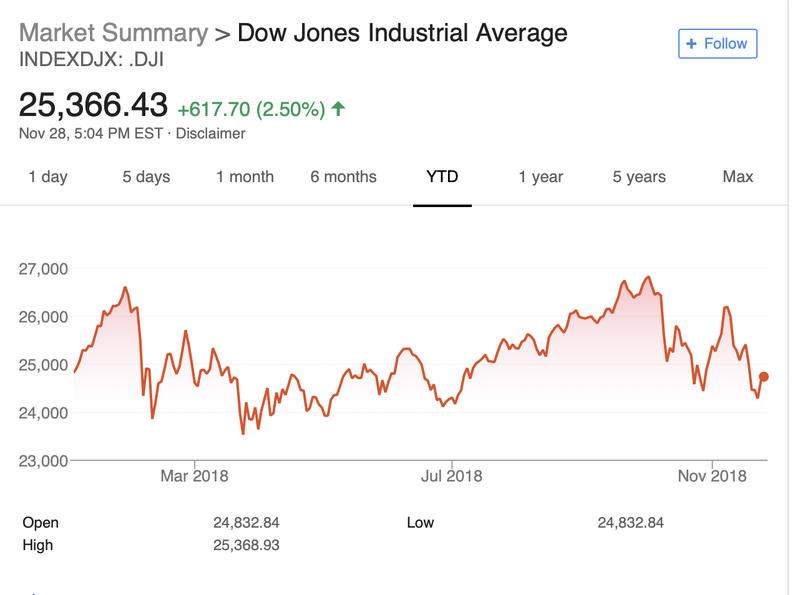 I remember that earlier in the year the president was taking credit for the economy and the stock market. That talk of economic success stopped after the market declined significantly in February. Since then, the trade war, tariffs, rising Fed interest rates, tech stock weakness, the threat of an impending government shut down have all battered investment accounts. I'm not saying that declines are over, but I hope we can level out the wild roller coaster ride that has been 2018. And all because of two words!